From todays walk in the woods. I recommend that you enlarge the first one. Sorry bad pun for such good shots. the first picture have of beautiful colors! great picture ! Oj,oj,oj! De där med gula fötter skulle jag vilja hitta en drös av. They are both great shots, Christina! The first one is so full of life in the wild! I like the crop on the second one. Both look great enlarged. What a bounty of mushrooms. The first one of the mushrooms in the woods looks so inviting - and the second one could be featured in a cooking magazine. These are great images Christina, reminds me of my younger days when I lived in Hamburg and went mushroom hunting with my Grandfather. I especially like the second shot with the tool included to give perspective. Were they yummy? 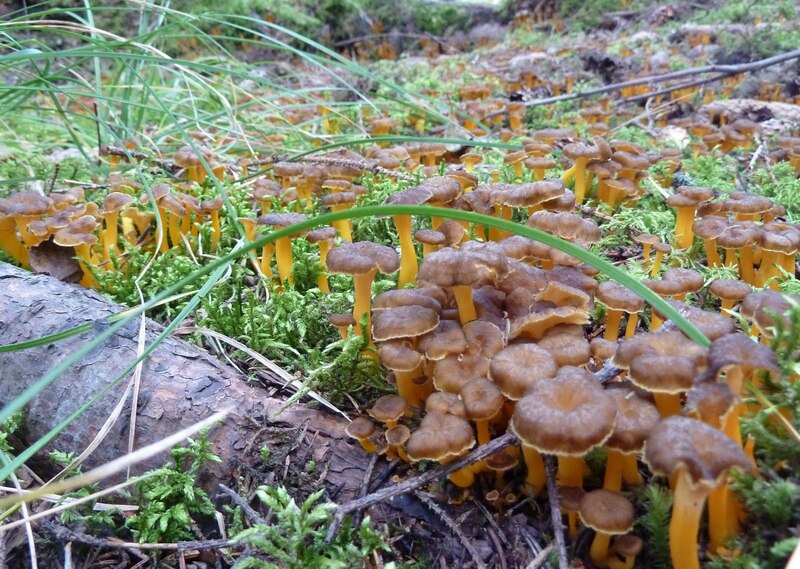 I have never seen a group of edible mushrooms like this! Incredible! I like that you have both shots... the one in the wild and the crop for the day. One of the things that I enjoyed about my visits to China was the variety of mushrooms that were used in our meals. We had one meal that each dish, over a dozen, was made with different mushrooms. Heaven! These are marvelous. Were they tasty? Wow! 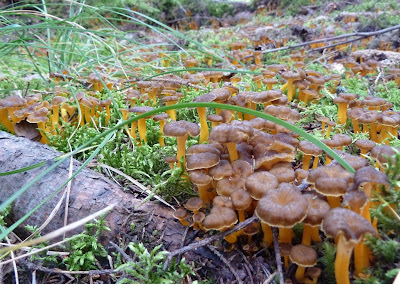 I have never seen so many mushrooms in the wild - especially ones that are edible. I like the difference between the two images - one ready for eating and the other showing them in their natural habitat. What a bounty! The top shot is beautifully made. 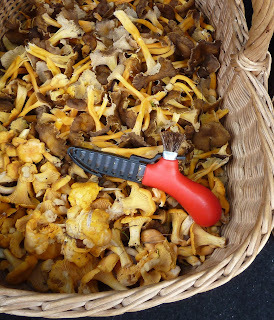 The basket with the perfect looking mushroom tool look like chanterelles.